“Client” shall be the person that makes the booking for themselves or on behalf of other persons. 1. Full acceptance of Alpine Pursuits’s price for the service requested is assumed at the time of booking. Alpine Pursuits will produce written confirmation of the details regarding the booking, by email, following payment. 2. All fares that appear on the Alpine Pursuits website/booking system, and prices quoted via email, telephone by an Alpine Pursuits representative or employee, are subject to change without notice until full payment is made. 3. The price paid by an Alpine Pursuits client when booking an airport transfer is subject to change without notice. If there are any fare changes necessary after the booking has been made, Alpine Pursuits will produce written confirmation of these changes by email. If the client does not want to accept the fare change, then he/she is free to cancel the booking free of charge and will be automatically refunded in full within 10 working days. 4. The airport transfer booking is not fully confirmed until reception by the client by email of the aforementioned written confirmation. If the client does not receive written confirmation by email then the transfer booking is considered invalid. This may occur due to an online technical fault, due to misinformation given by the client, or due to various other problems. The client should contact Alpine Pursuits if after 24 hours of making a booking they have not received written confirmation. 5. Airport transfers are scheduled only when full confirmation by email for the airport transfer booking has been received both by Alpine Pursuits and the client. 6. The client accepts these booking conditions on behalf of each member of the party. 7. When making a telephone booking the client accepts that the booking will be governed by the terms and conditions that are present on the Alpine Pursuits website at the time of booking. 8. The confirmation of booking must be presented by the client to the Alpine Pursuits driver or Alpine Pursuits representative for both the outward and return trip. 9. The destination and pick-up addresses on the ticket are the addresses to which the party will be delivered and picked up. Should the client wish to change these or any other details, this must be done in writing by email directly with Alpine Pursuits 24 hours prior to the date of travel, subject to payment of any difference in the applicable prices. We reserve the right to charge an administration fee for any booking that is amended at any time prior to departure. 10. Cancellations: up to 7 days prior to transfer; a cancelation administration fee of 20 Euros is applicable for all transfer types regardless of the number of passengers. Cancellations between 7 days and 24 hours prior to the transfer 50% of the price of the transfer will be refunded. Cancellations under 24 hours; full payment of the transfer. Alpine Pursuits may waive the payment at its discretion depending upon specific circumstances. Upon demand Alpine Pursuits will issue a statement of cancellation showing amounts charged for use in the event of an insurance claim. 11. All luggage must be clearly labelled with the owners name and destination address. Passengers are limited to two items of luggage (one usual holiday luggage bag and small hand luggage bag), and a ski or snowboard bag (snowboard coffin bags should be declared) and luggage larger than 1.5 cubic meters or longer than 1.7 meters long should also be declared. Any excess luggage must be declared at the time of booking. In the event of a passenger having excess luggage, Alpine Pursuits reserves the right to charge an excess baggage allowance, or refuse to transport the items. Clients are asked to keep Alpine Pursuits informed of any incidence of lost luggage. It is the responsibility of the airline and or handling agent of the airline to deliver any lost luggage to the passenger not Alpine Pursuits. Clients must understand that in the event of a delay exceeding 60 minutes caused by lost luggage, and if the allocated driver has to leave the airport prior to the arrival of the passenger, passengers will be placed on the next available transfer that is going to the requested destination, or in the direction of the requested destination. This may mean sharing a vehicle with other clients. Where a delay is of an exceptional length Alpine Pursuits may be forced to cancel the original airport transfer booking and reschedule a new transfer to cater for the ‘newly’ scheduled arrival time caused by the delay in waiting for lost luggage. In this case, passengers will be charged for the additional ‘new’ transfer, and no monies will be refunded for the cancelled transfer. Clients are free to refuse the ‘newly’ scheduled transfer and organise an alternative transfer themselves. 12. Bikes are transported free of charge. Clients must inform Alpine Pursuits at the time of booking of the number of bikes to be transported, failure to do so may result in Alpine Pursuits being unable to transport said bikes. Bikes must be presented for carriage in an appropriate box or bag. Bikes not in bags or boxes are not acceptable and will not be transported. 13. Golf clubs are transported free of charge. Clients must inform Alpine Pursuits at the time of booking of the number of sets of golf clubs to be transported, failure to do so may result in Alpine Pursuits being unable to transport said golf clubs. Golf clubs must be presented for carriage in an appropriate bag. Golf clubs not in bags are not acceptable and will not be transported. 14. Baby seats and booster seats are supplied free of charge upon request at time of booking. Children under the age of 12 are not permitted to travel in the front seats of any vehicle, children under 12 or 1m35cm must use the appropriate child seat. The child seats provided comply with all relevant legislation, if the client has a particular requirement regarding child seats they are advised to bring their own seat. Children under the age of 18 are not permitted to travel without a parent or guardian. Minors between the age of 16 and 18 assume full responsibility for their use of seat belts. Clients should note that while every endeavour is made to supply coaches with seat belts, coaches constructed before 2002 were not and are not retrospectively required to fit seat belts. 15. Alpine Pursuits will endeavour to honour special requirement requests but are not contractually obliged to do so. 16. Should more passengers present themselves for transfer than noted on the booking it may not be possible to carry the extra passenger(s). The extra passenger(s) will have to make their own way to their destination and Alpine Pursuits will accept no responsibility or liability for said extra passenger(s). If it is possible an extra charge may be applicable. 17. Pick up instructions: All pick up times for a service from resort to an airport must be reconfirmed with Alpine Pursuits the day before departure but not less than 24 hours before departure from resort. It is the clients’ responsibility to reconfirm the booking and if the booking is not so reconfirmed, Alpine Pursuits cannot guarantee that the service will be provided and Alpine Pursuits will not be liable for any losses or additional costs the passengers incurs. Alpine Pursuits schedule all departures to arrive at airports two hours before the scheduled departure time of a flight. Should a client insist on a change of pickup time allowing less time between leaving resort and the scheduled departure time Alpine Pursuits will accept no responsibility for any losses incurred due to missing a flight or onward connection. 18. Any service issues, should be directed to Alpine Pursuits via email at transfers@AlpinePursuits.com or by post to Alpine Pursuits, Route de Flerier, 74440 Taninges, France. Alpine Pursuits will endeavour to resolve all service issues within 28 days of notification. 19. Alpine Pursuits reserves the right (and delegates to its chauffeurs the right) to refuse to carry any person who is thought to be under the influence of alcohol or drugs and/or whose behaviour is considered to pose a threat to the driver, the vehicle or the other passenger(s). 20. Passengers who soil the interior of a van due to food, alcohol or drug consumption, are liable to an on the spot fine of 150.00 Euros. This fine is payable immediately to the Alpine Pursuits driver. If the passenger refuses to pay, or has no money with which to pay, then the 150.00 Euros valet cleaning fee will be taken on the credit card that the client used to make the booking, Alpine Pursuits will produce a receipt for this transaction. If payment cannot, or will not, be made Alpine Pursuits will cancel any outstanding transfer(s) for the passenger(s) concerned with no refund given and take legal action against the passenger(s) concerned to recover the cost of cleaning the vehicle this will included all legal fees Alpine Pursuits incur. 21. Parents, or minders (or friends over 18 years) of children and adolescents under the age of 18 years, are responsible for the conduct of these minors while in the Alpine Pursuits vehicles, and will be held responsible for any damage caused by the aforementioned minors. 22. Any damage caused to an Alpine Pursuits vehicle by a passenger(s) must be paid for immediately. If payment cannot, or will not, be made then Alpine Pursuits will be forced to take legal action against the passenger(s) in question. 23. Passengers are not allowed to take onto our vehicles any alcoholic drinks for the purpose of consuming them, or to drink such drinks on our vehicles. The consummation of food is not permitted on any Alpine Pursuits vehicle. 24. Smoking is not permitted in Alpine Pursuits vehicles. 25. Alpine Pursuits will use every reasonable means to ensure that the vehicle(s) arrives on time to begin the period of hire and that it reaches its destination on time. Alpine Pursuits will not incur any liability whatsoever in the event of any delay due to causes beyond its control. Vehicles are fully insured for passenger and third party claims, as required under French law. However, whilst every care is always taken, customers’ property is carried entirely at their own risk and no responsibility can be accepted for loss or damage. Customers are therefore advised to check their own travel insurance. If affected by any of the above situations or other unforeseen events Alpine Pursuits will make every effort to deliver the passenger to their destination. In the event of Alpine Pursuits being unable to deliver the passenger on time and or to their destination, Alpine Pursuits will not be held responsible for any losses or costs incurred. 27. Tunnel closures forcing alternative routes: A supplement is to be agreed (at the time of transfer or prior where possible) with client and paid on arrival in cash by the passenger if the client has not previously agreed to pay the supplement. The amount of the supplement will reflect the extra distance, time and tolls involved to transport the passenger to their booked destination. Where no agreement can be reached on the supplement to be paid, Alpine Pursuits will transport the passenger up to the point at which the normal route is blocked. Alpine Pursuits may waive the payment of the supplement at its discretion depending upon specific circumstances. 28. Sudden and unscheduled road closures forcing alternative routes: a supplement is to be agreed (at the time of transfer or prior where possible) with client and paid on arrival in cash by the passenger if the client has not previously taken agreed to pay the supplement. The amount of the supplement will reflect the extra distance, time and tolls involved to transport the passenger to their booked destination. Where no agreement can be reached on the supplement to be paid, Alpine Pursuits will transport the passenger up to the point at which the normal route is blocked. Alpine Pursuits may waive the payment of the supplement at its discretion depending upon specific circumstances. 29. Where Alpine Pursuits book transport on services provided by operators other than Alpine Pursuits we do so as agents for the operator concerned whose own conditions of carriage will apply and our liability will be confined to travel on our own services. 30. If Alpine Pursuits fail to provide a booked service because they are unable to contact the client due to a lack of mobile phone number, the said mobile phone number not being active or the phone remains unanswered when called, Alpine Pursuits will not be held responsible for any losses incurred. 31. If Alpine Pursuits fail for any reason within our control to deliver its passengers to their confirmed destination, Alpine Pursuits will provide suitable transport such as another coach, train, private car, taxi etc. Any reimbursement made by Alpine Pursuits for the costs of an alternative means of transport incurred by the passenger to get to their ticketed destination shall be no more than the cost of getting to that destination by one taxi of an appropriate size. Alpine Pursuits shall be allowed a period of 90 minutes commencing from the point at which the client presents themselves to an Alpine Pursuits representative, to supply the purchased service. 32. It is the responsibility of the client that all booking information is correct. 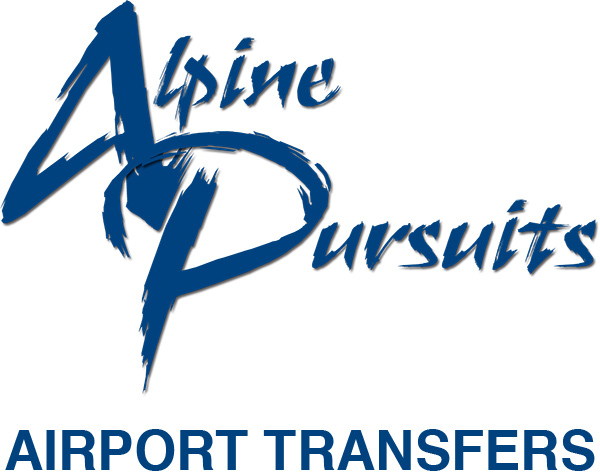 Alpine Pursuits accepts no responsibility for misinformation given by a client and that result in either a flight being missed or a driver failing to be at the arrival airport in question to pick-up a customer(s). If the client provide the take off time of a flight instead of an arrival time and as a result a vehicle(s) has to wait for the client, Alpine Pursuits reserve the right to charge waiting time fee of 1 Euro per minute, this is calculated as the difference between the time given and the actual scheduled landing time of the flight. 33. Delayed, Cancelled and Rescheduled Flights: Clients are asked to keep Alpine Pursuits informed about all possible delays and changes to their scheduled flight(s). Clients must understand that in the event of a delay exceeding 90 minutes, and if the allocated driver has to leave the airport prior to the arrival of the passenger(s), passengers will be placed on the next available transfer that is going to the requested destination, or in the direction of the requested destination. This may mean sharing a vehicle with other passengers. If the driver has to wait for over 90 minutes, there will be a charge, of 15.00 Euros per hour thereafter starting from the first minute of the following hour, if the passenger is unwilling or unable to pay for waiting time Alpine Pursuits may cancel the scheduled transfer. This charge may be waived by Alpine Pursuits. If Alpine Pursuits is aware of the new arrival time for the delayed flight before the specified driver leaves to go the airport for the flight arrival in question, then the driver will be instructed to leave according to the new arrival time and no supplement will be charged. However, if the flight delay is of an excessive length, due to circumstances such as flights being cancelled and passengers then arriving on alternative scheduled fights; or flights being rescheduled to later times; other airports or in the case where passengers miss their scheduled flights, and then book an alternative flight that arrives at a later time; then Alpine Pursuits may be forced to cancel the original airport transfer booking and reschedule a new transfer to cater for the ‘newly’ scheduled arrival time or airport. In this case, clients will be charged for the additional ‘new’ transfer, and no monies will be refunded for the cancelled transfer. Clients are free to refuse the ‘newly’ scheduled transfer and organise an alternative transfer themselves. 34. Alpine Pursuits shall only be liable for any reasonable and foreseeable consequential losses arising directly out of a breach of contract. 35. Alpine Pursuits may alter these terms and conditions from time to time, following which all transport reservations will be governed by that version. The terms governing the purchase of an airport transfer will be the terms in place at the time of your reservation. 36. Nothing can affect the clients’ statutory rights. 37. Alpine Pursuits’s Terms and conditions are governed by French Law. 38. Any dispute between Alpine Pursuits and a third party, if not resolved by mutual agreement shall be referred to a mediator. However, if mediation is unsuccessful, then the matter of the dispute will be referred to a formal litigation process through the French courts. 39. Fuel surcharge. Alpine Pursuits reserves the right to increase prices in accordance with fuel price rises and in accordance with point 3. 40. Privacy. Alpine Pursuits work with a number of partners and may share with these partners your email address and from time to time contact you via email regarding special offers. If you do not wish to be contacted about these offers or for Alpine Pursuits to share your email address you should inform us in writing by email or fax and we will respect your request. 41. Alpine Pursuits reserves the right to terminate any booking which is made in breach of general booking terms and conditions.